Pendants are one of my favorite kinds of necklaces because that dangling pop of jewelry is dramatic and fun; the length also handily draws your eyes down the entirety of the outfit and won’t crowd your face/neckline. Luckily for us, pendants are also the easiest kind of necklace to DIY, because you can pop a few beads and baubles together, slip it on a chain you already own, and BAM! You’re ready to go. That same chain can be used to showcase different pendants depending on your outfit and your mood. You can thrift the chain, of course, but you can also thrift the components of the pendant. I did one here that I’ve been wearing a lot this spring, and today I’m going to show you another one I recently created for the winter wardrobe I’ve been revamping this summer – but surprise, it works great for summer, too! 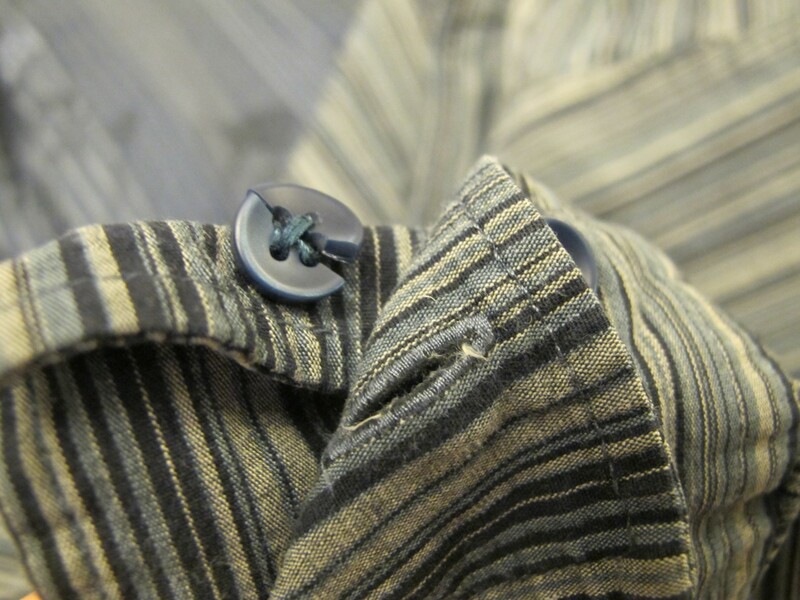 Tailoring is a tool everyone should have in their pockets because there’s no way mass-manufactured clothing will always fit your body perfectly. Thrifters need it even moreso to mold priceless-but-not-perfect secondhand finds into an effortlessly chic wardrobe that will leave you looking like (but not spending) a million bucks. 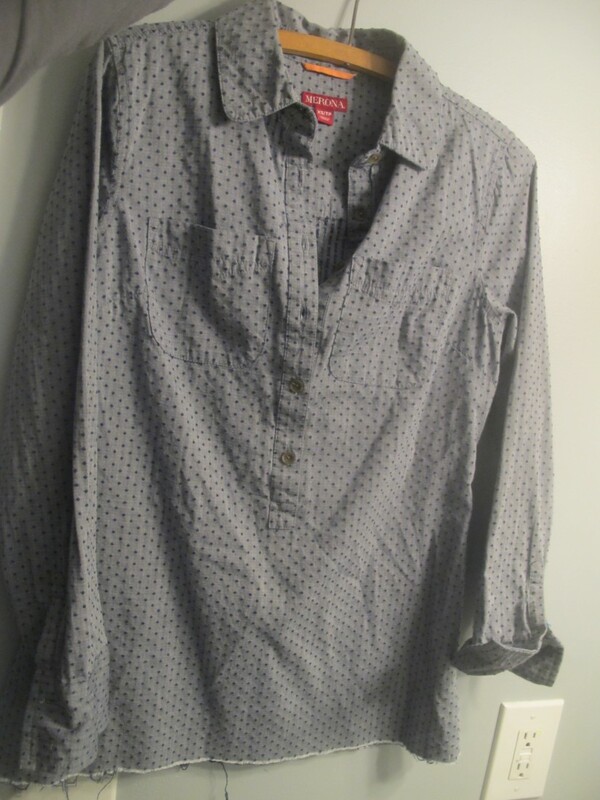 I bought this beauty back in the days of chilly weather and knew that its popover style, rollable sleeves, and cotton fabric would be a hit for spring and summer ’round these parts. It has been the week of sick and tired chez nous, so my spring wardrobe capsule will come out next week. 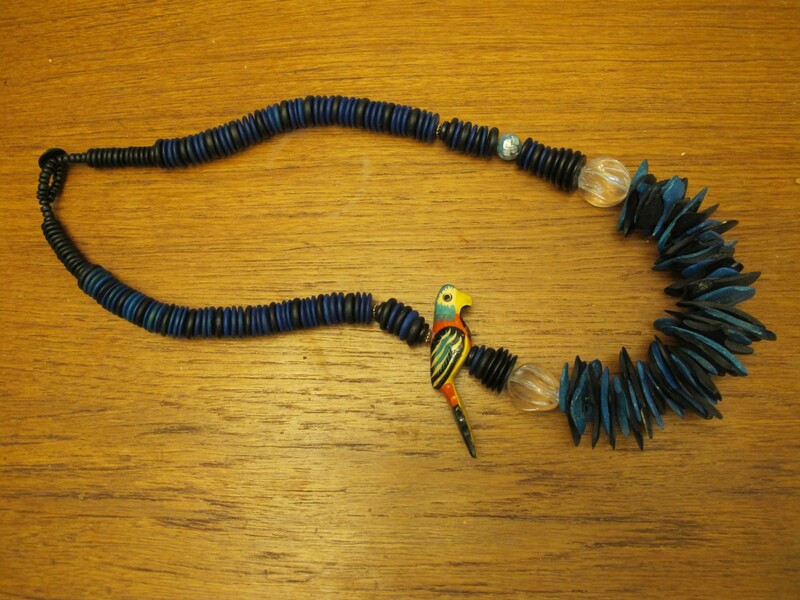 In the meantime, enjoy my recent necklace rehabs! Even though I rely on running for my primary exercise, I haven’t been running very much the last, oh, month or so? (Maybe 6 weeks.) I blame it on being dark when I get home and sometimes cold. Lucky me, days are longer and temps are warming up a bit—time to pull out the sports bras and the running shorts! 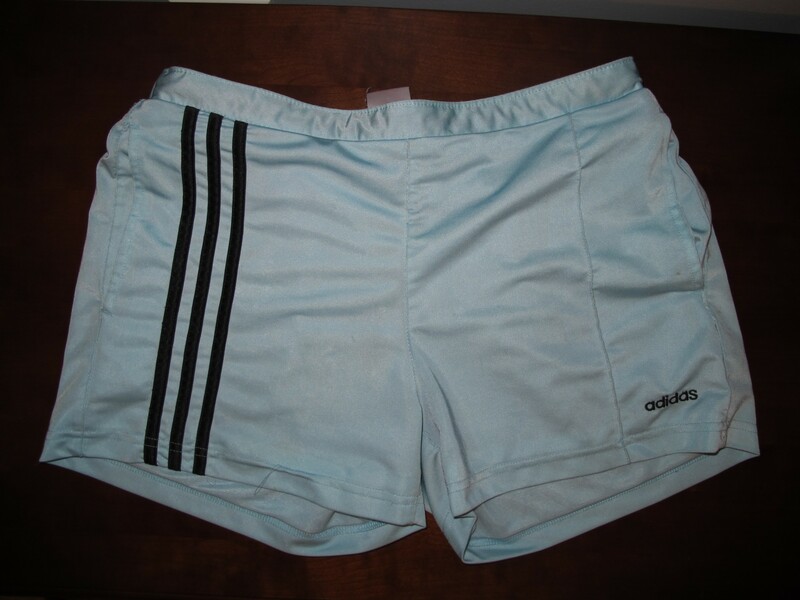 Only the tie on my lovely thrifted baby blue Adidas shorts was broooooken, which made them a little hard to keep up. I posted briefly about their rehab previously but thought I’d go into a little more detail now in honor of it being running season again. I don’t usually keep extras like this sitting around when I know I’m not going to use them (they get donated to keep my house from getting cluttered up), but for some reason I kept these tucked away. 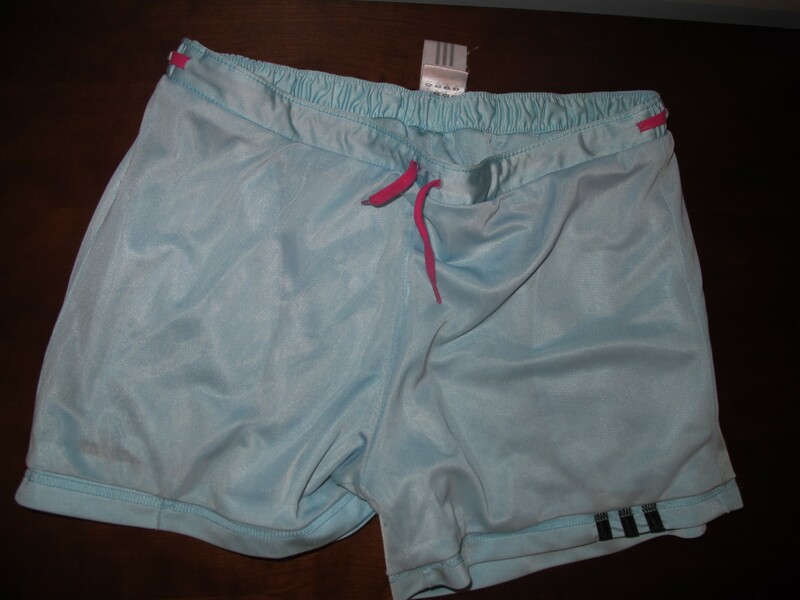 So when my spouse suggested I use the extra laces to fix my broken shorts instead of tossing them in the donate pile, I went for it. Then I tied the two pink laces together (yes I could’ve used the white pair but what fun is that? 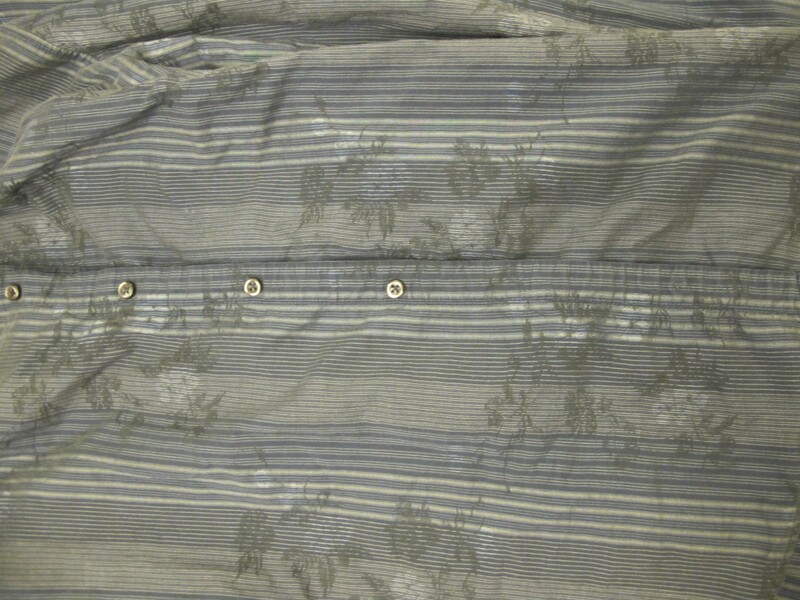 ), attached one end to a safety pin, and scrunched it through the hollow part of the waistband, jumping over the side seams at the slits on either side. Et voilà! Shorts back in action. Now I just have to get *me* back in action, ’cause I got a 5k to run over these serious Atlanta hills in April and it ain’t gonna be pretty if I don’t train. Wish me luck! 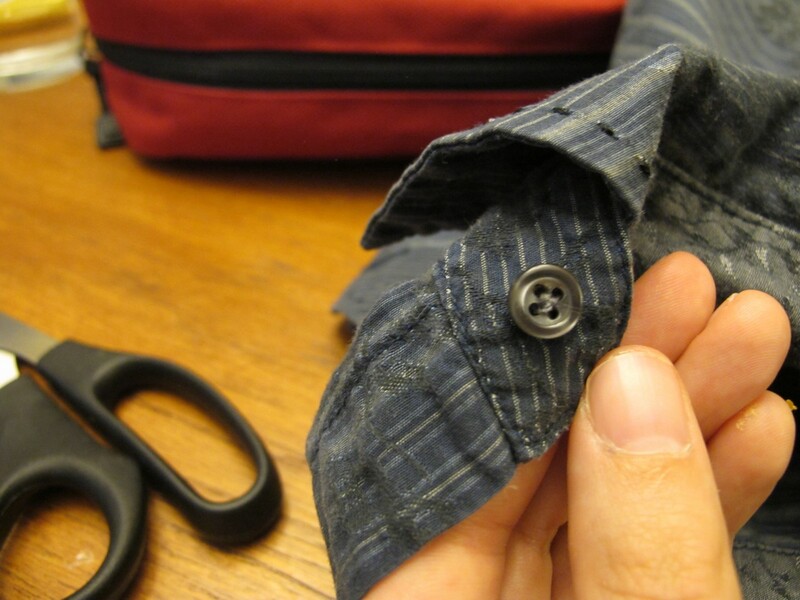 Have you ever used one part of a thrift to fix another? 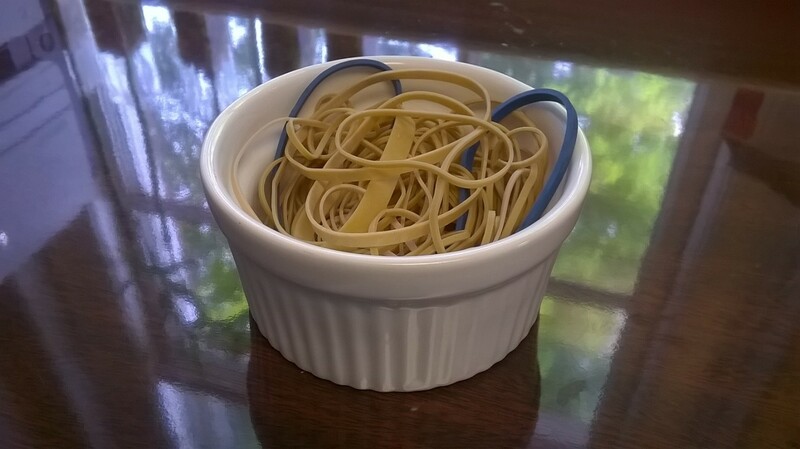 Do you tend to get rid of bits you’re not using right away or store them up for just such an occasion as this? Do you thrift workout wear? What’s your favorite secret for jump-starting your workout routine? And click here for tips on thrifting your workout clothes and to check out my (mostly thrifted) workout capsule wardrobe. Happy Groundhog Day! If you’re into all things Groundhoggish and/or Bill Murray, you might enjoy this post I wrote on another blog, in honor of the holiday. 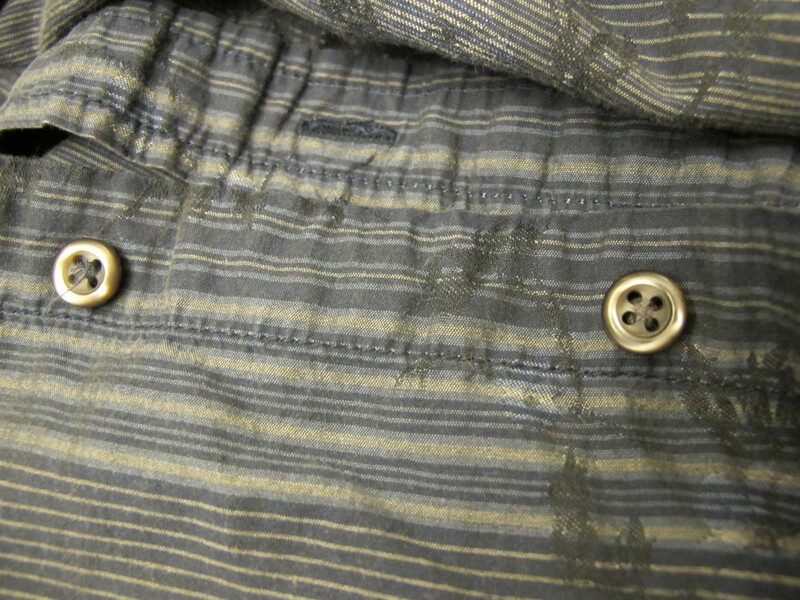 Here are some simple, photo- or video-illustrated, button-restoring tutorials to get your beloved shirt/pant back to its well-deserved spot in your closet of things you love to wear! Ta-da: slightly different thread color, but no one (but y’all) will know! 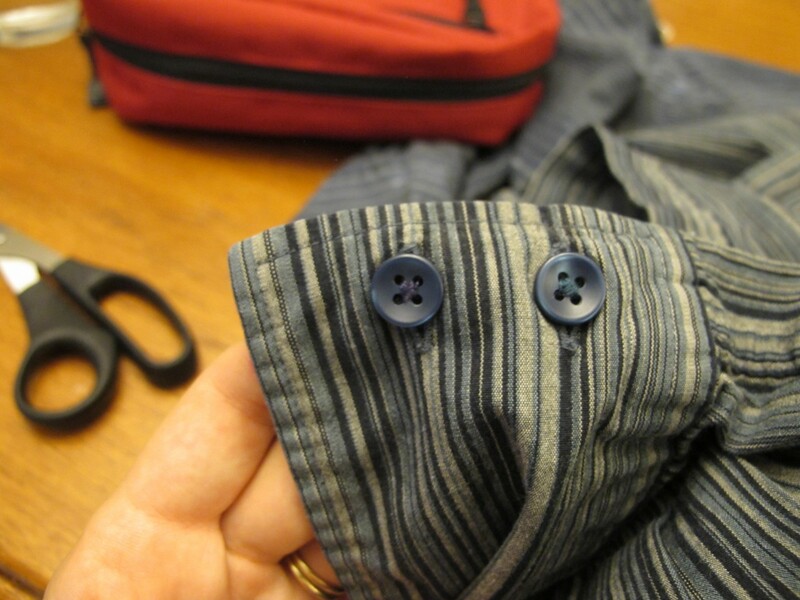 Get amongst this easy fix, Thrifters, and get back to wearing your favorite clothes! Thrift stores ain’t just for clothes, ya know! Home decor, kitchen tools, sports accoutrement, and office supplies are also great things to thrift. Below are some recently thrifted office supplies that are keeping me sane and on budget. I’ve been looking for a pair of sneakers to replace my beloved brown and coral Pumas. They were thrifted practically brand new at a Salvation Army store about 5 years ago and I have worn the crap* out of ’em–the paint’s coming off the leather, the stitching’s coming out of the suede, and it is time to retire them. 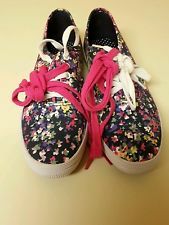 I happened upon these beauts by City Sneaks (a Payless brand) in a Goodwill a few months ago with not one, but two pairs of laces attached–white and fuchsia. My first reaction was that the laces looked like garish Minnie Mouse bows and they had to go; only then could the shoes could become a casual, fuller-coverage alternative to the sandals I live in during the summer. Did I mention I have (really) narrow feet? 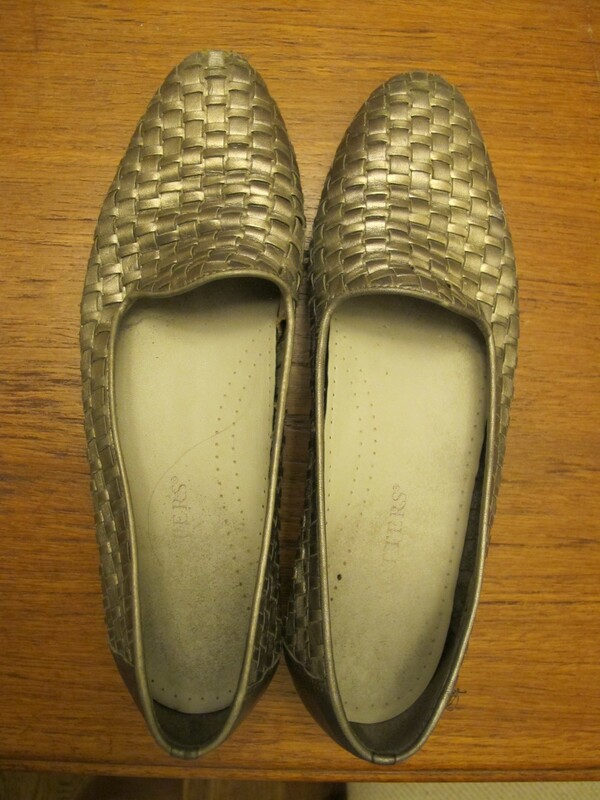 Trotters are one of the few brands that come in narrow options, and when I found this glorious golden pair at a local thrift shop a few years ago–in narrow, no less!–I jumped on them. They were a bit short, but that didn’t stop me from wearing the crap out of them–leather stretches, right? ?